The waters around Bermuda are warmed by the Gulf Stream, allowing some tropical marine species to thrive despite Bermuda’s location at 32 degrees north. Life in the ocean around Bermuda is strongly influenced by the warm Gulf Stream current. Sargassum is a brown algae that floats free on the surface of the ocean. Large mats of this seaweed are washed up on the shores of Bermuda at certain times of the year. 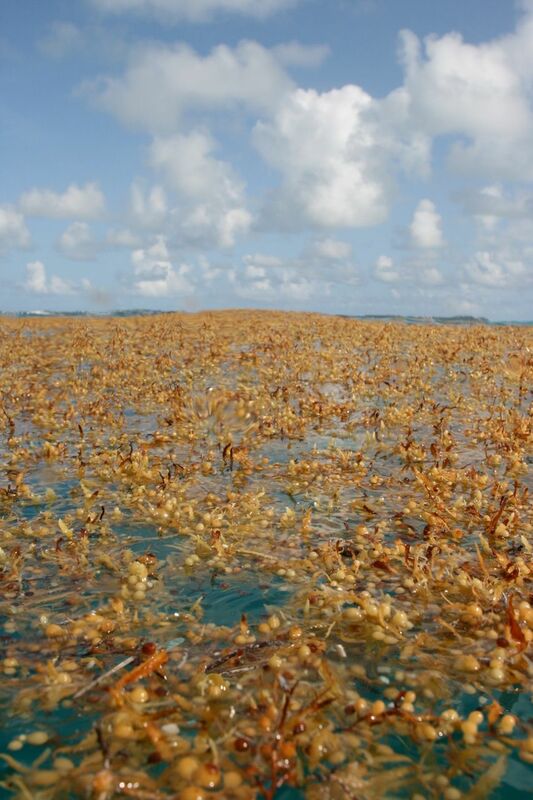 Sargassum has numerous round gas-filled floats that keep it afloat. Many open ocean animals can be found washed up on Bermuda's shores. The most recognized is the Portuguese Man-of-War (top) and the smaller By-the-wind-sailor (bottom). The Portuguese Man-o-War (Physalia physalis) is an open ocean jellyfish that is commonly washed ashore on Bermuda's beaches. The sting of the Portuguese Man-o-War is painful and should be treated promptly. The tentacles retain their stinging power even after the animal is dead on the beach so look, don't touch! Young Loggerhead Turtles live in rafts of Sargassum Weed in the open ocean. The Purple Ocean Snail (Janthina janthina) has a beautiful lavender and purple shell. It floats along attached to a raft of gas bubbles. These open sea snails can be found washed up on beaches after on-shore winds. Sargassum seaweed provides an attachment point for organisms like hydroids, bryozoans, tube worms, and encrusting calcareous algae. The American Eel (Anguilla rostrata) and the European Eel (Anguilla anguilla) migrate from the rivers of Europe and North America to the Sargasso Sea off Bermuda to breed. The European Eel is considered Critically Endangered due to overfishing and daming of rivers. Both adult and juvenile eels (Anguilla sp.) are found in the open ocean around Bermuda. The Bermuda Longtail or White-tailed Tropicbird (Phaethon lepturus catesbyi) travels long distances over the open ocean. The birds spend all their time at sea, only coming to land to nest. Many ocean drifting animals, like these By-the-wind-sailors (Velella velella) can be found washed up on Bermuda's beaches. Humpback Whales (Megaptera novaeangliae) migrate through Bermuda's waters in the spring and fall while traveling between their northern feeding grounds and southern breeding sites. Recent evidence suggest that some Humpbacks may be present in Bermuda's waters throughout the winter. This short film on the Sargasso Sea has been prepared by LookBermuda with sponsorship from the Atlantic Conservation Partnership.